Missile Command is a 1980 arcade game by Atari that was also licensed to Sega for European release. It was an immensely popular game that combined great game play with a rather chilling message about the dangers of war. Originally called 'Armaggedon', Missile Command was designed at a time that the United States and Russia were locked in a fierce 'cold war'. Missile Command was originally going to have a large status panel as part of its marquee which indicated the status of the bases and cities but it was eliminated when the designers learned that players lost track of on-screen gameplay when they looked up at the panel. The idea for Missile Command began with a magazine story about satellites that captured the attention of Atari's president, who passed the clipping to Lyle Rains. Rains asked Dave Theurer to lead the effort in creating the classic, action-packed arcade game. Missile Command gave the player control over three different missile silos that protected six "cities" on the ground below. Each silo had 10 missiles, and the player had to decide with silo to deploy the next missile from. Every missile was targeted by an on-screen cursor that was directed by a trackball. This control method predated the point and click method of computer interface by a number of years. 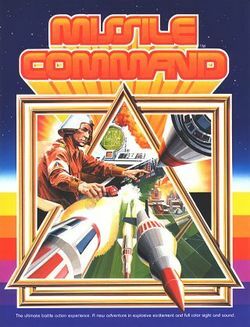 Missile Command was so popular, that some variation of the game made its way onto nearly every available platform in the early 80s and beyond whether it was an official conversion or not. Since this took place before Atari created their Atarisoft division, whose purpose was to port popular games that Atari owned the rights to other systems, Atari only officially converted the game for play on their popular systems. Most other conversions at the time were unauthorized. It was also released for download on Xbox Live Arcade with updated graphics. It is interesting to note that while the arcade game set no specific time or place, the original design cast the six cities in the game as six major cities on the west coast of the United States: Eureka, San Francisco, San Luis Obispo, Santa Barbara, Los Angeles, and San Diego. However, the manual for the Atari 2600 version of the game provides an entirely fictional back story for the game, presented here. Aliens from the planet of Krytol have begun an attack on the planet Zardon. The Krytolians are warriors out to destroy and seize the planet of Zardon. Zardon is the last of the peaceful planets. The Zardonians are skillful and hardworking people. Their cities are built-up and rich in resources. It is truly a planet void of crime and violence. Zardon has built a powerful defense system. Several antiballistic missile bases have been established within the cities of Zardon. The Zardonians are ready for this attack, and are prepared to fight to save their cities. As base commander it is your responsibility to protect and defend six cities on the planet of Zardon. The Krytolians have begun firing interplanetary ballistic missiles. They are aiming at your cities and missile bases. Your only defense is to fire back with antiballistic missiles. But watch out, the Krytolians are sly, they also have cruise missiles. Cruise missiles look like satellites, but they are just as deadly as the interplanetary ballistic missiles. Use your antiballistic missiles (ABMs) to stop the enemy before your happy and harmonious planet is destroyed. This page was last edited on 13 March 2012, at 03:14.